For more details on our packages, please click a link above or scroll down below. All packages are for both men and women who are 17 years of age or older (i.e. in post-puberty years as colouring is typically settled by then). Carol’s strong passion for colour analysis has driven her to become an expert in this field. She has completed advanced training in colour analysis (including colour healing) and often teaches the Colour Analysis and Wardrobe course at George Brown College in Toronto, Canada (schedule permitting). 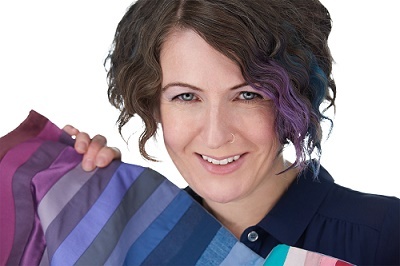 Carol loves to spread her passion and knowledge of colour analysis around the globe through her popular videos on YouTube, blogs on The Huffington Post and app Shopping My Colors. Carol has performed hundreds of in-person and online colour analysis consultations to date. She is so honoured to have inspired in-person and online clients from around the globe including clients from Australia, across Canada, Europe, Mexico, Saudi Arabia, South America, the United Kingdom and the U.S.A.
– Undertone, Seasonal, Flow Colour Analysis: includes full process to identify your optimal colours for clothing, accessories, jewellery, makeup and hair (using a 16 seasonal system view: 4 seasons with 4 flow options for each season). – Identifying your “Wow” colours for clothing, makeup and accessories by being draped in your palette once it is known. – A hair colour analysis: identifying your most optimal hair colour(s) – including trying on hair swatches. – A review of your makeup bag (if you wear makeup) and a few of your clothing items to see if they align with your colour palette. – A personalized report emailed to you highlighting your colour analysis results: clothing, accessories, jewellery, hair and makeup colour recommendations and other key information about your optimal colour palette. A picture of your seasonal colour palette (called a colour strip) will be included in your report for your reference and can easily be referred to on a phone during a shopping trip. – Optional add-on for an additional $50 plus HST: Personal colour wallet reference that includes 36 fabric colour swatches and a printed colour strip with more than 30 references. Click this link to watch a video of Carol performing some steps of an in-person colour analysis. In-person consultations are completed by Carol Brailey at her studio apartment space in the King and Bathurst (Fashion District) neighbourhood of downtown Toronto. Optimal natural daylighting and overall setup are key to an in-person colour analysis and that is why Carol prefers to have clients come to her space (which has natural daylighting via lamps or sunlight depending on day/time and overall space setup to perform colour analysis upon your arrival). Click this link to watch a video where Carol shares a behind the scenes look at her colour analysis and style consultation space (originally posted to our blog/YouTube). To book, please click on the Schedule Appointment button above or visit one of the direct online booking links below. Payment occurs at the end of your appointment time once your colour analysis is complete for most payment options (not at the time of booking). We accept VISA, Mastercard, Cash, PayPal and Etransfers. All appointment details including exact address (in Fashion District – King St.W/Front St.W and Bathurst St. area), parking/transit options, what to bring, how to prepare, payment options etc. will be included in the appointment instructions that will appear on your screen and automatically emailed to you once you book. Once payment is sent, email info@carolbrailey.com the name of the person you would like us to make the gift certificate out to. We will send a gift certificate PDF to your email address to give to the recipient within one business day. We will also email you a receipt from our accounting system within one business day. If you would like to book their appointment at the same time as ordering the gift certificate, you can do so through our online booking at this link. In the email that you send us, please also indicate you have gone ahead to book the appointment. Otherwise, we will include instructions on the gift certificate PDF on how to book the appointment. The gift certificate PDF will include all of the details needed for the appointment like exact address, parking/transit information, what to bring, how to prepare etc. If you require further information on this service, would like to book through email / phone, please complete the form on our Contact Page and we will get back to you within one business day. * After or along with a full in-person colour analysis, we recommend having your style analysis completed. A style consultation will equip you to display your authentic energy by dressing in a way that maximizes your body type, lifestyle and personality. Knowing your best colours and styles are both key ingredients to shopping and choosing items that show off your sparkle! – Visit VirtualColorAnalysis.com for our packages and process to book. An online or virtual colour analysis is most ideal if you do not live close to an experienced colour analysis professional. This page also includes videos walking through how Carol completes an online colour analysis, plus DIY Colour Analysis Kits. Note: An in-person colour consultation is always the best option if it is available to you. An in-person consultation allows you to visually experience why certain colours do and do not give off your best, you get to try on hair colour swatches, you are draped in your best colour palette (once it is known) and gives you the best guarantee to ensure required lighting and other contributors to an accurate colour analysis are in place. On Carol Brailey’s Do-It-Yourself (DIY) Online Course: 5 Easy DIY Steps to Reveal Undertone and Colour Analysis Results, Carol reveals her 5 Recommended DIY Colour Analysis Steps through step-by-step workshop videos, offline and online colour test tools and online community to guide you through your own DIY Colour Analysis. These 5 steps along with details about how an eye pattern can reveal your seasonal colour palette will never be revealed on our YouTube Channel. Perfect for the Do-It-Yourself or Self Colour Analyzer and/or if you want to use colour analysis to help your clients reveal their best hair, makeup, clothing and accessory colours (e.g. hairstylists, makeup artists, opticians, photographers, etc.). – A DIY or self colour analysis is most ideal if you do not live close to an experienced colour analysis professional and do not want to complete an online or virtual colour analysis (above). For more information on Carol Brailey’s thoughts on an in-person vs. online vs. DIY colour analysis, please see this blog post. – An in-person colour consultation is always the best option if it is available to you. An in-person consultation allows you to visually experience why certain colours do and do not give off your best, you get to try on hair colour swatches, you are draped in your best colour palette (once it is known) and gives you the best guarantee to ensure required lighting and other contributors to an accurate colour analysis are in place. Have you already been colour analyzed through another professional or service and/or are you confident in what your seasonal colour palette is? The products below may be of interest to you. – The Already Know My Colours Tier on Carol Brailey’s Do-It-Yourself (DIY) Online Course Page: In addition to recommended hair, makeup, clothing and accessory colours for each seasonal colour palette, this Tier also includes access to video examples of people within each palette that Carol has analyzed and/or have been analyzed by another professional Carol trusts along with common eye colour(s), skin characteristics and hair characteristics for each palette. Great to help you validate your palette! – Makeup and Colour Fans from Color Me Beautiful: Including lipsticks, blush, eye shadows, eye pencils for each primary colour season. – Colour Analysis Products from the International Image Institute: Including colour swatch fabric wallets and printed colour strips for each seasonal colour palette. – Tote bags on Teespring for each seasonal colour palette. – Colour Strip Downloads For Your Phone : Includes colour strip JPG downloads for each seasonal colour palette. – The Shopping My Colors App: This App is available for download to your mobile device and includes recommended hair, makeup, clothing and accessory colours for each seasonal colour palette. – Undertone, Seasonal and Flow analysis (using a 16 seasonal system view: 4 seasons with 4 flow options for each season). – Optional add-on for an additional $50 plus HST per person: Personal colour wallet reference that includes 36 fabric colour swatches and a printed colour strip with more than 30 references. – If your party has over 5 guests to be colour analyzed (and not more than 10), Carol will bring along a second colour analysis expert she trusts to assist. – To and from travel costs to your location from the King West neighbourhood of downtown Toronto will be added to your invoice (typically Uber is used) plus an additional $60 per hour of travel (prorated) to account for travel time to your location. If party is for over 5 guests, Carol’s additional resource’s travel costs will be charged as well at same rate noted above. – Natural lighting is most ideal for colour analysis, however, if this is not possible, Carol will have her colour analysis lamps on hand. – Invoicing will be sent to the person holding the party. A 50% deposit is required at least one week in advance of the party, with remainder of amount owing due before Carol leaves your location. – Visit our Online Booking Page to view our current availability for a specific date and time i.e. your party date/time (please don’t book online though). Please complete the form on our Contact Page to discuss booking your colour analysis party package and we will get back to you within one business day.